How Do You Store Print Marketing Collateral in the Digital Age? We might live in the digital age, but not everything has gone digital. The worlds of sales and marketing straddle the line between print and online media every day. When selling your brand, you have to provide a wide variety of information about your company to all kinds of audiences. And you have to be ready to provide them that information in the format they want it in. Which means the best way to accomplish this task is to have a wide variety of marketing collateral on-hand that exists both digitally and in print. Storing the digital marketing collateral is easy because space is virtually unlimited and everything can be dragged and dropped into a folder to keep it organized. On the other hand, storing and organizing hard copy versions of your marketing collateral can be more of a challenge. What are you supposed to do with all that paper? It’s time to take a lesson in storage from the mailroom. Mail clerks store, sort, and distribute a wide variety of mail every day in addition to the many other tasks they are asked to complete. And they have a secret weapon that helps them do it: mail sorting furniture. Is Mail Really that Different From Marketing Collateral? You’ve probably walked right by the mail sorting furniture in your office without even noticing it. But take a closer look, and you will realize that all the mail for your office is most likely stored in a sorter. Even if you have a small office, mail will still be kept in a sorter – it will just be a little smaller. You can store and organize your marketing collateral in the same sorters. Because really they aren’t designed specifically for mail, just documents. And what exactly are hard copies or print versions of your marketing collateral? If you guessed documents, you’d be correct! Whether you have a lot of marketing collateral to store or just a little, it’s okay because mail sorting furniture comes in so many different sizes and configurations. There are freestanding sorters for larger needs and smaller desktop sorters for smaller needs. And you can also combine tables and cabinets with your sorters to create an entire document storage station. 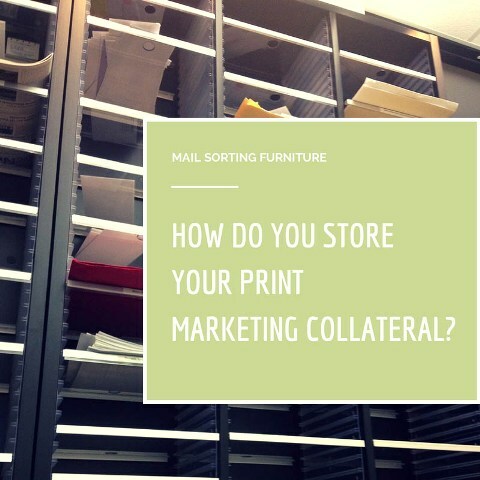 What Makes Mail Sorters so Useful for Storing Marketing Collateral? Easily adjustable shelves: the shelves slide in and out to adjust the opening on 1 inch increments. You can store bulky press kits or just a few brochures in the same sorter. Colored labels: the shelves have colored labels that can be changed at any time. This way you can name and color-code what’s in each shelf to take out the guess-work. Optional transparent shelves: these shelves let light pass through the sorter unit making stored marketing collateral easy to see. No sharp edges: the shelves are designed without any sharp edges, making it easy to grab documents without any risks of injury. Where Can You Find Mail Sorting Furniture? Now that you know you want some mail sorting furniture, where can you get it? 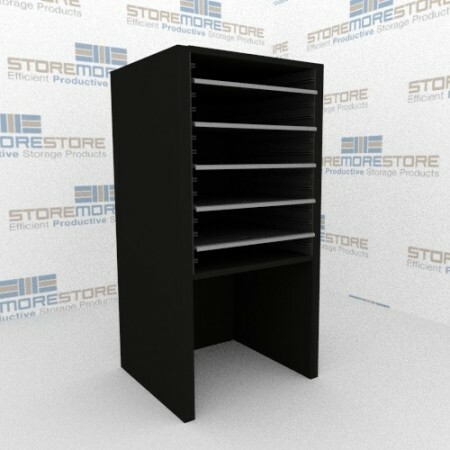 StoreMoreStore has a variety of mail sorting furniture that you can use for storing and organizing marketing collateral. And if you can’t find what you’re looking for or have any questions, give us call 1-855-786-7667!